The value of two currencies relative to each other. For example, on a given day, one may trade one U.S. dollar for a certain number of British pounds. A currency's exchange rates may be floating (that is, they may change from day to day) or they may be pegged to another currency. A floating exchange rate is dependent on the supply and demand of the involved currencies, as well as the amount of the currency held in foreign reserves. On the other hand, a government may peg its currency to a certain amount in another currency or currency basket. For example, the Qatari riyal has been worth 0.274725 dollars since 1980. An advantage to a floating exchange rate is the fact that it tends to be more economically efficient. However, floating exchange rates tend to be more volatile, depending on the particular currency. Pegged exchange rates are generally more stable, but, since they are set by government fiat, they may take political rather than economic conditions into account. For example, some countries peg their exchange rates artificially low with respect to a major trading partner to make their exports to that partner artificially cheap. See also: Currency pair, Eurodollar. The price of one currency expressed in terms of another currency. For example, if the U.S. dollar buys 1.40 Canadian dollars, the exchange rate is 1.4 to 1. Changes in exchange rates have significant effects on the profits of multinational corporations. Exchange rate changes also affect the value of foreign investments held by individual investors. For a U.S. investor owning Japanese securities, a strengthening of the U.S. dollar relative to the yen tends to reduce the value of the Japanese securities because the yen value of the securities is worth fewer dollars. Also called foreign exchange rate. See also devaluation, fixed exchange rate, floating exchange rate, foreign exchange risk. How do currency exchange rates influence investment values? When the exchange rate between the foreign currency of an international investment and the U.S. dollar changes, it can increase or reduce your investment return. Because foreign companies trade and pay dividends in the currency of their local market, you will need to convert the cash you receive from dividends or the sale of the investment into U.S. dollars. Therefore, if the exchange rate changes significantly between the time you buy and the time you sell, it can sometimes turn a positive return in the investment itself into a loss for the investment in total, or vice versa. International investment returns increase when the dollar weakens in value against another currency, because each unit of foreign currency translates into more U.S. dollars. On the other hand, if the U.S. dollar strengthens against the foreign currency, it translates each foreign currency unit into fewer U.S. dollars and therefore diminishes your returns. The exchange rate is the price at which the currency of one country can be converted to the currency of another. Although some exchange rates are fixed by agreement, most fluctuate or float from day to day. Daily exchange rates are listed in the financial sections of newspapers and can also be found on financial websites. The price of one country's currency expressed in terms of another country's currency; for example, one UK pound (£) = two US dollars ($). Because there are a large number of countries participating in the international economy, multi-exchange rate systems are required in order to synchronize and, in some cases, coordinate and harmonize exchange rates. Under a FIXED EXCHANGE RATE SYSTEM, exchange rates, once established, will remain unchanged for longish periods. If a particular country's exchange rate gets too far out of line with underlying market conditions, however, and becomes overvalued for example, resulting in that country being persistently in BALANCE OF PAYMENTS deficit, the exchange rate can be devalued (see DEVALUATION), i.e. refixed at a lower level which makes its imports more expensive and its exports cheaper. Similarly, if the exchange rate becomes undervalued, resulting in a country being persistently in balance of payments surplus, the exchange rate can be revalued, i.e. refixed at a higher value, which makes its imports cheaper and its exports more expensive (see REVALUATION). Over time, exchange rates, if left unregulated by the authorities, will fluctuate according to changes in underlying market conditions, reflecting such things as differences in INFLATION rates and INTEREST RATES between countries. For example, if the prices of UK goods rise faster than the prices of equivalent US goods, people will tend to buy more US goods, causing the dollar to appreciate and the £ to depreciate. On the other hand, if UK interest rates are higher than US interest rates, this will encourage US investors to deposit money in the UK money markets, causing the £ to appreciate against the dollar. Under a FLOATING EXCHANGE RATE SYSTEM, the exchange rate is free to fluctuate day by day and will fall (see DEPRECIATION) or rise (see APPRECIATION) in line with changing market conditions, serving (in theory) to keep a country's balance of payments more or less in equilibrium on a continuous basis. In practice, however, the uncertainties and SPECULATION associated with free floats tend to produce erratic and random exchange rate movements which act to inhibit trade as well as producing destabilizing domestic effects. For these reasons countries often prefer to ‘manage’ their exchange rates, both to moderate the degree of short-run fluctuation and to smooth out the long-run trend line. The term effective exchange rate is used to describe a given currency's value in terms of a weighted average of a ‘basket'of other currencies, expressed as an index number. The sterling exchange rate index (1990=100) has fluctuated, averaging 104 (in 1999), 107 (2000), 106 (2001), 106 (2002), 100 (2003) and 104 (2004). Recently, the £ has been strong against the USA $ and weak against the EURO. A rise (appreciation) in the effective exchange rate indicates a general deterioration in the price competitiveness of a country's products vis-à-vis trade partners. In FOREIGN EXCHANGE MARKETS the exchange rate may be quoted either in terms of how many units of a foreign currency may be bought or sold per unit of the domestic currency (an indirect quotation), or in terms of how many units of domestic currency may be bought or sold per unit of a particular foreign currency (a direct quotation). For example, in the UK an indirect quotation of the exchange rate between the Pound and the US dollar might be £1 = $2, whereas a direct quotation would be $1 = 50 pence. Exchange rates are usually quoted by dealers as a pair of rates, the offer or sell rate and the bid or buy rate, the difference between the two (the spread) representing the dealers' profit margin. Currencies which are traded in large volumes, such as the US dollar and Japanese yen, usually have a narrower spread than currencies which are little used in international dealings. Similarly, the spread on current exchange rates quoted in the SPOT MARKET for currencies is usually narrower than the spread on forward prices quoted in the FORWARD MARKET. See CROSS RATE, EXCHANGE RATE EXPOSURE. Fig. 66 Exchange rate. 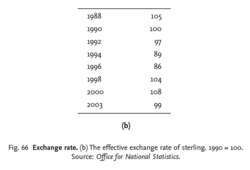 (b) The effective exchange rate of sterling. 1990 = 100. Source: Office for National Statistics. Fig. 66 Exchange rate. 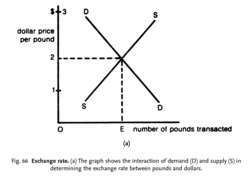 (a) The graph shows the interaction of demand (D) and supply (S) in determining the exchange rate between pounds and dollars. The price of one CURRENCY expressed in terms of some other currency. Fig. 66 (a) shows the rate, or price, at which dollars ($s) might be exchanged for pounds (£s). The demand curve (D) for £s is downwards-sloping, reflecting the fact that if £s become less expensive to Ameri-cans, British goods, services and assets will become cheaper to them. This causes Americans to demand greater quantities of British goods, etc., and therefore greater amounts of £s with which to buy those items. The supply curve (S) of £s is upwards-sloping, reflecting the fact that as the dollar price of £s rises, American goods, services and assets become cheaper to the British. This causes the British to demand greater quantities of American goods, etc., and hence the greater the supply of £s offered in exchange for $s with which to purchase those items. The equilibrium rate of exchange between the two currencies is determined by the intersection of the demand and supply schedules ($2 = £1, in Fig. 66 (a). Under a FIXED EXCHANGE-RATE SYSTEM the exchange rate, once established, will remain unchanged for longish periods. If the exchange rate gets too much out of line with underlying market conditions, however, and becomes overvalued, resulting in a country being persistently in BALANCE OF PAYMENTS deficit, the exchange rate can be devalued, i.e. refixed at a new lower value, which makes IMPORTS more expensive and its EXPORTS cheaper (see DEVALUATION). By the same token, if the exchange rate becomes undervalued, resulting in a country being persistently in balance of payments surplus, the exchange rate can be revalued, i.e. refixed at a new higher value, which makes imports cheaper and its exports more expensive (see REVALUATION). Governments, however, often tend to delay altering the exchange rate, particularly in respect of devaluing, so that the pegged rate gets seriously out of line with underlying market tendencies. When this happens, SPECULATION against the currency builds up, leading to highly disruptive HOT MONEY flows that destabilize currency markets. Over time, exchange rates, if left unregulated by the authorities, will fluctuate according to changes in underlying market conditions, reflecting such things as differences in INFLATION rates and INTEREST RATES between countries. For example, if the prices of UK goods rise faster than the prices of equivalent American goods, people will tend to buy more American goods, causing the $ to appreciate and the £ to depreciate. On the other hand, if UK interest rates are higher than American interest rates, this will encourage American investors to deposit money in the UK money markets, causing the £ to appreciate against the $. Under a FLOATING EXCHANGE RATE SYSTEM, the exchange rate is free to fluctuate day by day and will fall (see DEPRECIATION) or rise (see APPRECIATION) in line with changing market conditions, serving (in theory) to keep a country's balance of payments more or less in equilibrium on a continuous basis. In practice, however, the uncertainties and speculation associated with ‘free’ floats tend to produce erratic and random exchange-rate movements, which tend to inhibit trade as well as producing destabilizing domestic effects. For these reasons, countries often prefer to ‘manage’ their exchange rates, both to moderate the degree of short-run fluctuation and to ‘smooth out’ the long-run trend line. As a result of regional economic alliances (e.g. the EUROPEAN UNION), some countries are involved in both fixed and floating exchange-rate systems. For example, France is a member of the EU's ECONOMIC AND MONETARY UNION, which has a common currency, -the EURO. By contrast, the euro ‘floats’ against the US $, Japanese yen, etc., so the euro rate against the $ or yen fluctuates on a daily basis (See also EUROPEAN MONETARY SYSTEM). The term effective exchange rate is used to describe a given currency's value in terms of a trade-weighted average of a ‘basket’ of other currencies where the weight attached to each currency in the basket depends upon its share of total INTERNATIONAL TRADE. Fig. 66 (b) depicts the ‘effective exchange rate’ over time of the £ against other major countries’ currencies, for example, the US $, Japanese yen, etc. A fall (depreciation) in the effective (nominal) exchange rate indicates a general improvement in the price competitiveness of a country's products vis-à-vis trade partners. In FOREIGN EXCHANGE MARKETS the exchange rate may be quoted either in terms of how many units of a foreign currency may be bought or sold per unit of the domestic currency (an ‘indirect quotation’) or in terms of how many units of domestic currency may be bought or sold per unit of a particular foreign currency (a ‘direct quotation’). For example, in the UK an indirect quotation of the exchange rate between the £ and the US $ might be £1 = $2, whereas a direct quotation would be $1 = 50 pence. Exchange rates are usually quoted by dealers as a ‘pair’ of rates, the ‘offer’ (or sell) rate and the ‘bid’ (or buy) rate, the difference between the two (the ‘spread’) representing the dealers’ profit margin. Currencies that are traded in large volumes, such as the US $, usually have a narrower spread than currencies that are little used in international dealings. Similarly, the spread on current exchange rate quoted in the SPOT MARKET for currencies is usually narrower than the spread on forward prices quoted in the FUTURES MARKET. See EXCHANGE RATE EXPOSURE, BALANCE OF PAYMENTS EQUILIBRIUM, PURCHASING-POWER PARITY THEORY, ASSET VALUE THEORY. Although there are many kinds of money changing, it is certainly enough to make a threefold division. Many clubs are still in the process of re-adjusting their finances, so I doubt we will see much money changing hands. WHO the hell still uses those money changing booths at the Border? When you think of the money changing hands for even average stars, I think David has been the bargain buy of the last five years. Imagine the thrill of seeing how insider deals are put together, of real money changing hands, of souls being bartered away to put more police on the streets and more kids in after-school programs. The money changing hands can be as little as pounds 1 or can run into several thousand. Father-of-four Bacro Kvec, 32, was due to appear at Stirling Sheriff Court yesterday over claims that he conned three banks out of pounds 930 in a money changing scam. The new agreement, which doesn't involve any money changing hands, lasts for five years and puts an end to the various disputes between the two companies. Many people might have suspected that there were gifts and money changing hands, but we were dismayed to find out it is quite widespread. On Free Cone Day, Ben & Jerry's fans can get in line as many times as they want, and the line moves quickly because there's no money changing hands. KABUL (PAN): The main money changing Bazaar in the capital, Srai-i-Shahzada Market Thursday remained closed to protest the killing of Herat money changers union chief, here in Kabul on Thursday. They vary in their evaluation however: Some say that such money changing is unjust and usury; others, indeed, that they are permissible.